This home theater in a box includes just about every modern feature you could want in a budget-priced system. Immersive audio is the next big thing in movies and TV soundtracks. Putting together a traditional surround system‚ much less an immersive audio system, can be a daunting and confusing task. 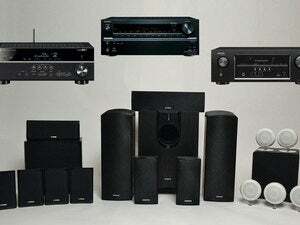 Onkyo aims to dispel confusion while delivering solid performance with its $899 HT-S7700 HTIB package. The HT-S7700 delivers a full 5.1.2-channel Dolby Atmos experience without requiring you to install speakers in your ceiling (you can learn all about Dolby Atmos and immersive audio here). 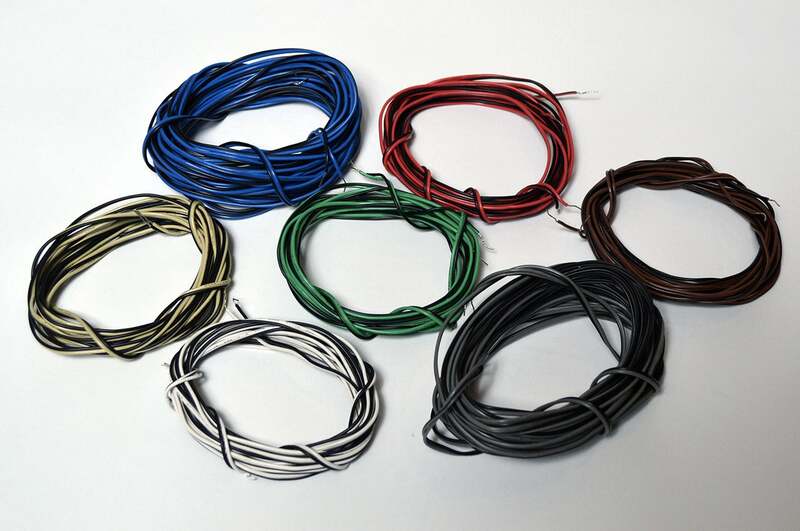 The system consists of an A/V receiver, five satellite speakers, a powered subwoofer, color-coded and pre-cut speaker cables, and a subwoofer cable. The front left and right speakers have additional speakers on top of the cabinets that perform as Dolby Atmos height channels, bouncing sound off your ceiling. The speaker cabinets aren’t plastic, like what Yamaha ships with its YHT-5920ULB HTIB system, but neither or they fabricated from the high-quality plywood or even medium-density fiberboard (MDF) materials that are so valued for their neutral acoustic character. They seem to be made of a less-dense particle board. Having said that, the cabinets feel sturdier than Yamaha’s speakers. They sound better, too. 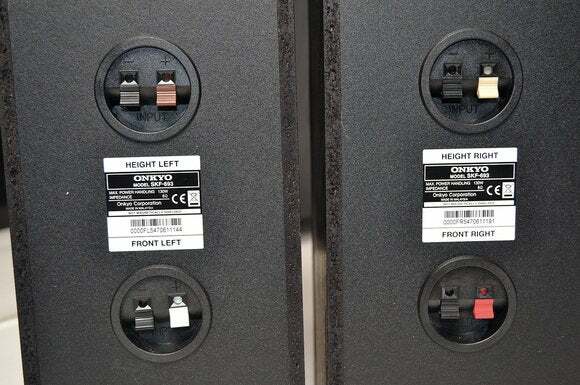 There are two pairs of spring-loaded terminals on Onkyo's front left and right speakers, because the speakers on top of the cabinets reproduce the height effects in Dolby Atmos soundtracks. The Onkyo HT-R693 A/V receiver included in this package has seven HDMI inputs and two HDMI outputs, so you can support both a TV and a video projector without needing to swap cables. But only one HDMI input and one HDMI output is compatible with the latest version of digital copy protection—HDCP 2.2—that you’ll find in 4K UHD video-playback devices, such as Ultra HD Blu-ray players. Onkyo’s receiver offers strong home-networking features, thanks to Wi-Fi, Bluetooth, and ethernet connectivity. The free Onkyo Mobile App allows you to control the entire system from your phone or tablet, and you can stream audio directly from your networked mobile device, computer, or media server. The receiver also supports popular streaming-audio services such as Spotify, Pandora, SiriusXM Internet Radio, Slacker, Aupeo, and TuneIn. This system can decode a variety of audio codecs, including FLAC, ALAC, DSD, and MP3. If you own a turntable, the A/V receiver in Onkyo's HTIB system is the only one we reviewed to be equipped with a phono input. 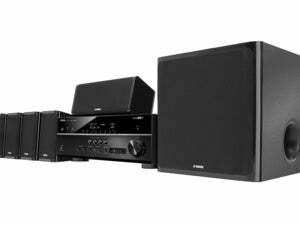 Onkyo doesn’t have a wireless multi-room audio system that can compete with Yamaha’s MusicCast technology, but this receiver can be connected to a pair of wired speakers—or to a stereo amplifier—in a second room (Zone 2). On the surface, the HT-S7700 packs in a ton of features where it counts. Let’s see how it all comes together. 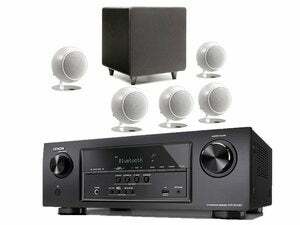 Onkyo says it designed the HT-S7700 to be one of the easiest HTIB systems to set up, and they deliver on that promise. There’s no need to strip or cut wires—everything is pre-cut. The colors on the back of each speaker matches the color on the receiver’s rear panel and even the colors of the speaker cables, so you’d have to be very careless to hook up the speakers incorrectly. 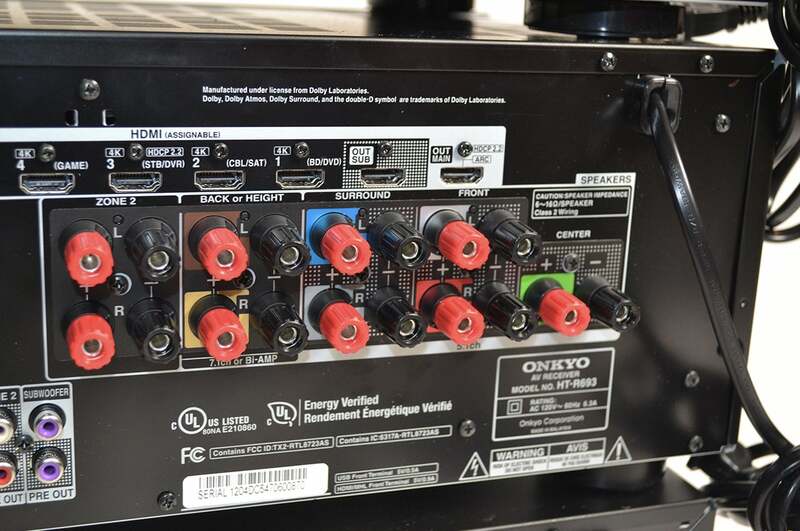 Most people will place the front speakers closer to the receiver; as such, Onkyo provides longer cables for connecting the surround channels. My listening position was 13 feet from the receiver, and I had plenty of cable to accommodate that scenario. The included subwoofer, which sports a 10-inch driver, was larger than I expected. Onkyo provides color-coded speaker cables with its HT-S7700 to make setup easier. In a matter of 20 minutes, I had everything unpacked and connected and I was ready to use the receiver’s AccuEQ room correction software. AccuEQ will equalize the system for speaker distance, type, crossover, and output level, and it can apply a dose of digital EQ in an effort to correct for acoustic anomalies in your listening environment. Room correction can be a blessing, but it’s rarely a panacea. It’s most effective when you’ve placed your speakers correctly. To use AccuEQ, you plug the included microphone into the receiver’s front panel and then initiate the step-by-step guide. The whole process takes only a few minutes to complete. Most people will find listening to music on the Onkyo system to be a highly satisfactory experience—especially music with good bass lines. I’d even say it was high value for this price point. The system imaged well and presented a well-developed soundstage. Nevertheless, there was persistent image smearing–especially when I wanted to focus in on individual instruments during songs. They just seemed to blend together. Various tracks from the Star Wars: The Force Awakens soundtrack, for example, came across relatively well, but exhibited an overall boxy sound. The Onkyo subwoofer fared well with orchestral music and gave percussion instruments satisfying weight. Bass lines were a strong suit with Loreena McKennitt’s From Istanbul to Athens Gates of Istanbul, too. Bass notes had solid presence. I liked it. Midrange frequencies, on the other hand, came across a bit dark and muddy. Flutes especially lacked their delicate air. Comparing the Onkyo to Orb Audio’s Complete Home Theater, the Orb setup sounded much more open and nuanced. The guitar at the opening of U2’s “Song for Someone” from Songs of Innocence lacked a natural, full-bodied presence on the Onkyo system, and I missed the delicate sense of fingers striking the guitar strings. Comparatively speaking, through the Orb Audio setup I had a much better sense of the guitar's body and its individual strings being pucked and strummed. Onkyo's receiver delivers the most flexibility connecting outboard audio and video equipment. To take full advantage of the Onkyo’s Dolby Atmos audio capabilities, you’ll need a Blu-ray player and a Blu-ray movie mastered in Dolby Atmos. Thankfully, the number of Dolby Atmos movies being released is increasing each month. I gave the Onkyo a serious workout with Mad Max: Fury Road. I had the opportunity to see this movie in the theater as well as review it as part of another, much-higher-end Dolby Atmos setup. Consequently, I knew this movie well and felt it would be a perfect test. Firing up Fury Road I immediately noticed that the Onkyo makes it a point to try and envelope you with sound with a very aggressive approach to reproducing the surround mix. Given the potential target audience, I think this will go over favorably. If you’re new to surround sound, you probably want to hear every speaker getting a workout. Because of the Dolby Atmos-enabled speakers, the front part of the room plays much larger and deeper than you might expect given their size. While those speakers were no substitute for discrete, in-ceiling speakers, they did contribute positively to the overall experience. What I missed, in comparison with higher-end Dolby Atmos systems, was any sense of depth behind my listening position. That’s to be expected, of course because you can't connect rear height speakers to this system. That minor quibble aside, I did find it quite remarkable—if not uncanny—how clear and clean the Onkyo rendered the dialog in this movie. I’ve auditioned comparable systems that did a terrible job of reproducing dialog clearly. Onkyo's receiver was the only home theater in a box we reviewed that has two HDMI outputs, so you can connect a TV and a video projector at the same time. I was pleasantly surprised at the performance of Onkyo's subwoofer. A 10-inch subwoofer won’t deliver deep bass, but the Onkyo sub gave me a top-to-bottom, thoroughly satisfying experience. Best of all, the Onkyo sub didn’t try to reproduce bass beyond its means. When manufacturers try to do too much, they just make a muddy mess. The HT-S7700 is a real winner for the first-time home-theater buyer and technology novice. It’s a solid, feature-rich package that delivers a thoroughly enjoyable and satisfying movie experience at home. Throw in the Dolby Atmos implementation, and you have a package that will bring a big smile to your face.